Burglars entered a Boystown mom & pop pharmacy by smashing the front door glass sometime between closing time yesterday and 5:50 this morning. Officers found the store's cash drawer and lottery machine about a half-block away. The first report of trouble at Save-Rite Pharmacy, 3479 N. Broadway at Cornelia, came in around 5:50 this morning when a 911 caller reported the front glass broken. Investigating officers soon found the store's property lying in the street near 623 W. Cornelia. The store owners are determining if other property was taken. On October 26, a woman was caught on video smashing through the front glass of Pie Hole Pizza Joint in an attempt to steal an iPad from the restaurant's counter. 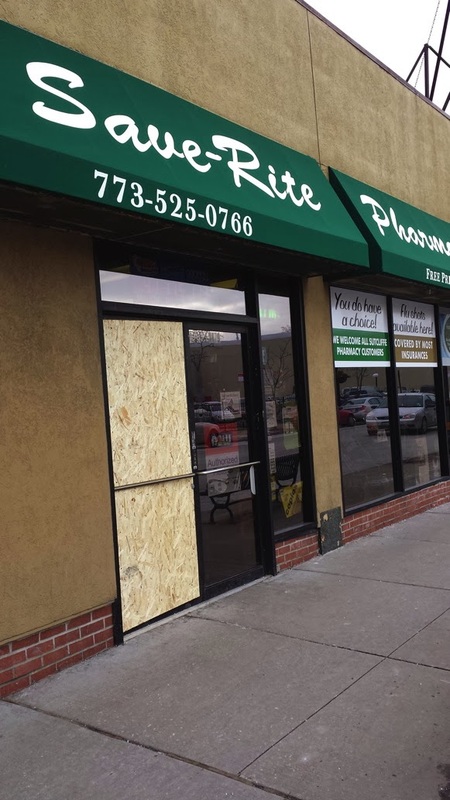 Pie Hole is located directly south of the pharmacy and the offender was reported to have escaped along the same route taken by this morning's burglars. Front glass has been broken out of a number of storefronts during overnight hours recently. Today's Chicago Police Department case number is HX117499.